In Asia, there are 4 billion people and 10 million non-profit organisations and social enterprises. We see tremendous potential in the collective power of socially-minded individuals and organizations in Asia to make a difference. As pro bono intermediaries, we commit to improving society by mobilizing and empowering talent to provide professional services for greater social impact. These pro bono services will be delivered in partnership with individuals and corporates to strengthen and assist initiatives tackling complex social problems in areas such as poverty, education, health, welfare and the environment. a) Define, communicate and champion high-impact pro bono projects. b) Collaborate with partner pro bono intermediaries across Asia to improve delivery of programs and services. c) Share current impact data and develop better methods for impact measurement. As participants of the inaugural Asia Pro Bono Rally 2014, we agree to collaborate together further in a spirit of mutual improvement and friendship to achieve the above goals. We will do good better! 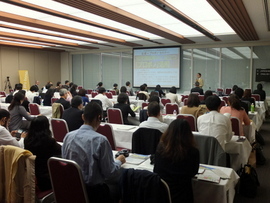 Asian pro bono intermediaries get together in Tokyo. A new step for civil exchange between Asian societies. 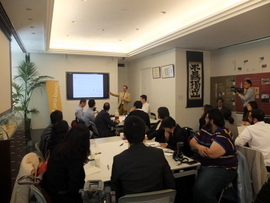 The 1st East Asia Pro Bono Conference was held in October 2013 in Seoul, South Korea. The idea of the Asia Pro Bono Rally originated from a desire to continue the efforts from the Seoul conference in Tokyo. The Asia Pro Bono Rally 2014 in Tokyo is a conference focused on gaining insight into the pro bono movement across Asia and determining next steps for pro bono and civil society in each participating country. Following Pro Bono Week, a global campaign that celebrates and activates pro bono service across all professions that use their talents to make a difference, this convening brings together Asian pro bono intermediaries and corporations interested in doing pro bono. Building off the momentum from Pro Bono Week, the Asia Pro Bono Rally comes at an opportune moment to share knowledge, present case studies, discuss various models of pro bono, showcase pioneer movements in each society, and bring more impact to civil societies throughout Asia. Feel the energy surrounding the pro bono movement and attend this special event. 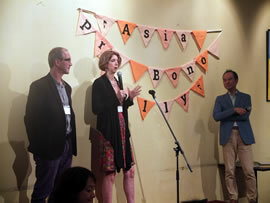 Special guests propelling the pro bono movement in Asia! 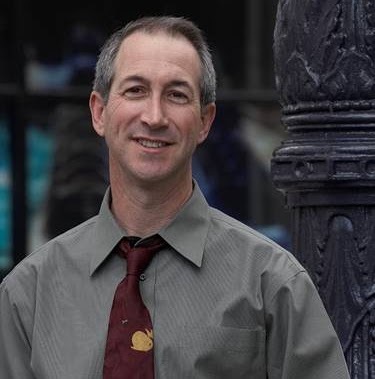 Taproot Foundation, a pioneer and thought leader in pro bono service, and the BMW Foundation, an international networking foundation supporting pro bono intermediaries worldwide, will be special guests speaking to the power of pro bono and inspiring action. 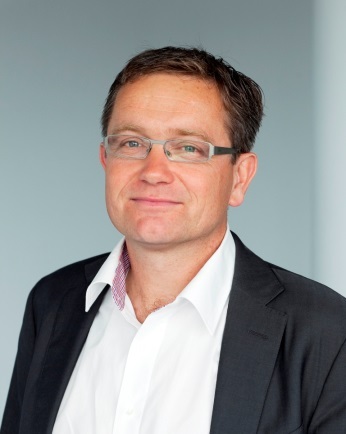 Don't miss the message from BMW Foundation's Executive Director, Markus Hipp and Taproot Foundation's CEO, Liz Hamburg, as they speak about the future of the pro bono movement in Asia. 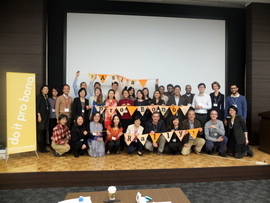 October 27th, 2014 - Service Grant Japan marked the opening of Asia Pro Bono Rally 2014 in Tokyo with Asian pro bono intermediaries. 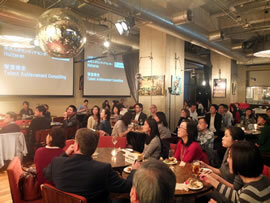 On the first day of the Rally, we had "Welcome Party & Pro Bono Workers Lounge" in a cozy dining, NOS ORG in Shibuya, Tokyo. 24 guests from 11 organizations joined us. Participating organizations include 9 Asian intermediaries, BMW foundation, an international foundation supporting the network of pro bono intermediaries worldwide, and Taproot foundation, a pioneer in pro bono service and a model for Service Grant Japan. They enjoyed meals and sharing experiences with more than 40 participants from Japan, including pro bono workers. Followed by the greetings from and Ikuma Saga, CEO of Service Grant Japan and Markus Hipp, Executive Director of BMW foundation, the guests from each intermediaries came on stage and introduced us about the backgrounds on pro bono in each country, their organizations'missions, projects, and enthusiasm for the Rally. The methods for pro bono differ from country to country, and we discovered variety of interesting stories. 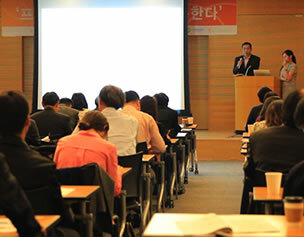 For example, Talent Achievement Consulting in China makes use of pro bono in development of corporate human resources. iVolunteer in India said that they closely examined non-profits of 3,000,000 organizations in India and chooses appropriate ones to support by pro bono and it has become their specialty as a pro bono intermediary. Thai Young Philanthropist Network (TYPN) in Thailand makes collaborations between graduate students from foreign top universities and social entrepreneurs. Empact in Singapore works on cross border pro bono projects. As the last speaker, Liz Hamburg, CEO of Taproot foundation, announced that they had just started a new online service Taproot+(plus) a week ago. This is a remarkable online platform designed for non-profits to enable them to find appropriate pro bono workers who can solve their problems and challenges as an organization. 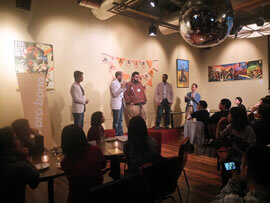 In the end of the party, we could see our guests and the participants talk passionately about pro bono all around. We made a great start to the 3-day Pro Bono Rally. Discussion by pro bono intermediaries. 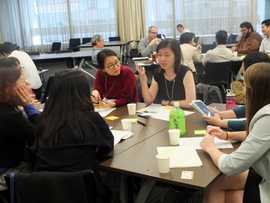 October 28th, the second day of the Asia Pro Bono Rally, began with group discussion which 24 global fellows of pro bono intermediaries participated in. In order to explore ways of more collaboration between pro bono intermediaries in Asia, we discussed the subjects of the feasibility of international pro bono projects and the proposals for collaborations with global companies. First, we started with self introductions from each intermediaries to share pro bono activities across Asia, which was also a rehearsal of pro bono conference, the main event on the next day. Some of the fellows even used their power point materials to give presentations focused on their own unique pro bono models, so that we could deepen our understanding and interest each other. After that, the workshop with a role playing was held on the theme of "What if a pro bono worker wants to do pro bono overseas?" Each participants played one role, such as pro bono workers, corporate officers where pro bono workers belong to, etc. We discussed problems we may face when sending pro bono workers to different countries and what kind of synergy effect we could generate, and so on. There were many concerns raised – "Sharing information can be a large burden" "Who takes responsibility for financial support?" "How to manage different languages and cultures?" On the other hand, participants addressed lots of positive opinions – "It could be a chance to develop pro bono workers'career." "Pro bono will promote cultural exchange." "It could lead to innovation by collaborating with various sectors from home and abroad." Asian fellows will visit several nonprofit organizations which has received pro bono support in the past. The program for the afternoon of the second day was Site Visits for non-profit organizations. 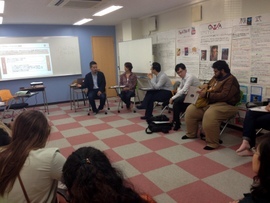 Global fellows were divided into 3 groups, and each groups went to visit the non-profits which Service Grant Japan had supported with pro bono projects before. 3 non-profits that they visited this time were below: Tokyo Community School (TCS), operating a full-time alternative school for primary schoolchild / Fine, providing counseling services and peer support network of the infertility treatment patient / tadaima!, supporting the couples caring for children by promoting methodology to share housework themselves. All the non-profits have experienced pro bono projects, such as developing website, business flow design, marketing research. 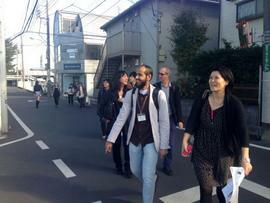 Global fellows left Shinjuku for each non-profits'sites, Nakano(TCS), Kiba(Fine), Nishi-Kokubunji(tadaima!). They visited and took a tour of the school or the offices and talked with their staff about how they leveraged pro bono programs, what impact was brought by the projects. tadaima! 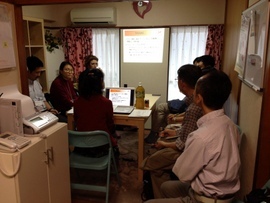 is the first organization that was supported by "mamabono" a unique program of Service Grant Japan. Here the project teams are consists of only mothers who is off the work, during taking maternity leave or after quitting their former job in order for child rearing. The fellows visiting tadaima! seemed so interested in the mamaboo's way, such as their meeting style with on-site-baby-care service or mamabono as a step for mothers to get back to work. Some of the fellows said that they would want to try mamabono in their countries as well. They asked tadaima! 's staff so many questions that the interpreters couldn't catch up, because each fellows from different countries had his or her questions based on each countries'situation. That was very meaningful opportunity for the fellows that they were able to hear the real feedback from non-profits'staffs and learn about pro bono examples and programs in Japan. More discussion by pro bono intermediaries. On the last day of the Pro Bono Rally, we started with the second group discussion in the morning. To move forward from yesterday's discussion, we discussed what the actionable agendas would be for international collaboration by pro bono intermediaries. 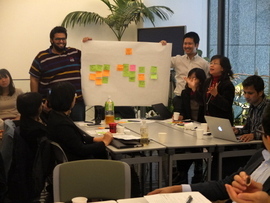 Many challenges, such as financial problems, cross-cultural understanding, system construction methods, were presented in the previous discussion. Divided into 3 groups, we exchanged ideas on how to solve these challenges, summarized and shared our thoughts about the agenda that Asian pro bono intermediaries should work together on. We got lots of practical opinions and various ideas proposed as following: Why don't we make case studies with the best practices from each organization? Can we try exchanging our office staffs with each other ? What if we introduce local seminars and networking to pro bono workers in each countries, have them visit different countries or organizations and deepen exchanges ? Not only these ideas, but also the very basic challenges such as that we really need to increase recognition of pro bono itself was pointed out by many of us. 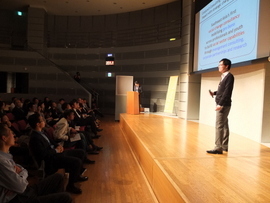 In the afternoon of the 29th, "Corporate Pro Bono Seminar – Utilizing pro bono to solve managerial problems and challenges in corporations" was held at Keidanren Conference in Otemachi, Tokyo. More than 80 participants from different corporations gathered and took part in the 3-hour presentations and panel discussion on the practices or possibilities of pro bono for various aspects of corporate management. As the examples of corporate pro bono projects in Japan, there were two presentations given: "In-house Pro Bono Trial – findings from done-in-a-day pro bono program" by Ryuichiro Motoki, Johnson & Johnson Social Contributions Committee and "Reconstruction and Pro Bono – possibility of pro bono gained through our reconstruction support for the earthquake-affected areas" by Takeyuki Nakagawa, Mitsubishi Corporation. Also, Rie Fujisawa from Tokyo Metropolitan University graduate school proposed her study of organizational identification on the possibility of pro bono that could enable corporate employees to rebuild relationship with their organizations and to be more positive towards their jobs. These presentations were followed by presentations by international guests. After the video message from Markus Hipp, the Executive Director of BMW foundation, Liz Hamburg, President & CEO of Taproot foundation made a presentation providing a multifaceted perspective on corporate involvement with pro bono, which were recent trends in the US and in other countries, the value of introducing pro bono into corporations, and the use of pro bono in terms of the human resource development or the employee retention. Peter Yang, founder and executive director of Empact ,Singapore, introduced the recent situation in Singapore that social entrepreneurs and pro bono were becoming a major national interests. Also he introduced case studies of their unique pro bono models in Singapore, such as combining students and skilled workers, and cross-border projects. In the last part of the seminar, moderated by Koichi Kaneda, Takeda Pharmaceutical Company, there was a panel discussion with Shunichi Ikeda, NEC Corporation, Kotoko Togo, Panasonic Corporation, and Ikuma Saga, Service Grant Japan. The discussion went on over 4 perspectives: the hurdles and risks for introducing pro bono into their corporations, the benefits from corporate pro bono, the relationship with human resources departments, further possibilities of corporation pro bono. It was a great opportunity to share widely the knowledge and information accumulated through each panelists'actual practices. "The Asia Pro Bono conference" that became the finale of the Asia Pro Bono Rally opened a curtain at 18:45 on the 29th of October. Approximately 110 people, including business people, non-profits, students, etc. gathered in the Tokyo women's plaza. Chizuru Azuma, a famous and popular actress in Japan, joined as a guest commentator. As introduction, Ikuma Saga, CEO, Service Grant Japan, and Ms. Azuma showed various numbers to do with current circumstances of pro bono and social sectors in Asian countries. For example, there are approximately 500,000 incorporated social organizations in China and 2,000,000 grass-root ones. The number gets much bigger to exceed 3,000,000 in India.In the comparison of work experience, pro bono workers in Japan and South Korea have more than 10 years of work experience, whereas younger employees plays larger part of pro bono movement in countries of Southeast Asia. As for the length of pro bono projects, short-term projects such as two days program done in weekend are popular in China while long term programs which often take three to six months are common in Japan. Everyone noticed diversity and variety of pro bono models by this compact introduction. Following presentations by 9 pro bono intermediaries delivered various stories about various models and challenges across Asian countries. The first presenter was Huizeren from China. The organization is the pioneer in China as pro bono intermediary organization dispatching volunteers with specialized skills to non-profit sectors. They have supported more than 500 non-profit organizations up to the present and are going to start up "China Pro Bono Alliance" in the near future by connecting multi-sector organizations and corporations who would play important roles in development of pro bono movement in China. Talent Achievement Consulting (TAC) in China was just established this autumn. They support several non-profits through consultation with an aim in producing maximum effects with minimum resources by using technologies. They focus on human resource development by utilizing pro bono program, and they are seeking corporations to start their practices. It was impressive that Keven, the representative, dreamed of actualizing kind and gentle society through technology, love and pleasure. The following presentation was made SESNET from South Korea. They support start-ups and development of social entrepreneurs through 6 types of various pro bono programs. One of the remarkable programs is called "Pro bono hub school," which provides social entrepreneurs with educational support to build up skills and knowledge such as marketing and photography. "BRIDGE" is another pro bono organization from South Korea. They re-defined pro bono as a tool for cross-sector collaboration, and they launched online educational platform in Cambodia. A Korean enterprise provided IT technology while Cambodian education group develops contents and the Department of Education of Cambodia dispatches teachers to the program. This demonstrates that the project was realized by the cooperation of academy, industry and government. Empact from Singapore attached great importance to rolling up passionate youngsters in pro bono. They involve highly skilled professionals and match with students studying IT, investment and finance to deliver high quality pro bono works. Empact also operates a pro bono program to mobilize C-level corporate executives to mentor young social entrepreneurs. Their programs gave discovery and innovation not only for youths but also for mentors. "It is possible for professionals and students at any levels to contribute to society by joining pro bono activities." Conjunct Consulting pays attention to the huge growth of social sector in Singapore. A survey tells that 43% of Singaporeans are interested in doing pro bono. They offer consulting services to several local non-profit organizations and their projects which they dispatch professional consultants and university students together to non-profit clients are very highly evaluated. Thai Young Philanthropist Network from Thailand creates a program for graduate students to support Thai non-profit organizations and social enterprises in the associated fields for their study. Beneficiaries, student in overseas and domestic students as supporters for communication between two collaborate to tackle with the social problems. This program obtains governmental support as well. iVolunteer, a pro bono intermediary in India, has 7 offices in nation-wide. One of their unique programs is called "White Board" which corporate executives with more than 15 years of work experience support non-profits one by one. It is important for executives, handling large sum of money in their daily business, to work with non-profits to bring positive effect without hanging money. This could bring positive effects in terms of those executives'talent development. The last presenter was Ghadan from Saudi Arabia. It is believed that the volunteer market is considered to be relatively small in the country, but they believe pro bono program is the most effective way to raise the public attention towards volunteerism in quality and quantity. For instance, they utilize skills of university students and professionals of oil company to provide pieces of advice for better production operation to a non-profit organization. After 7 months of support, more efficient operation has become practicable by installing lean process. Ghadan aims to build pro bono database across Saudi Arabia in the near future. There was also a surprise present handed to Mr.Saga with a feeling of gratefulness. 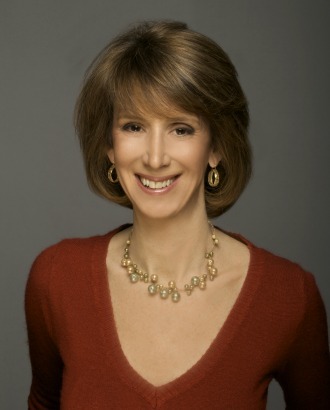 In the "Global Pro Bono Talk" session, Liz Hamburg, CEO Taproot Foundation, gave a brief presentation. The term pro bono was originally used with legal counseling, but has opened its gate to great variety of support such as marketing, design, HR, IT and accounting. Taproot activities consist of three elements: do, enable and inspire. While they are operating standard pro bono projects, consulting service to help design original programs for multi-national corporations. Liz also mentioned that the general interest towards volunteering increase year by year in US by referring to the news that approximately 2.5 million people had shown interest in skilled-based volunteering in LinkedIn profiles. In particular, the young people called "Generation Y" (born in 1975 through 1989) remarkably show high interest towards skilled-based volunteering. As a part of "inspire" strategy, Taproot hosts and joins various events in US and the globe to further network and promote high quality pro bono implementation. This include Global pro bono Summit which started in 2013. "Let's liven up our passion to pro bono together" Liz concluded the talk. At the closing, all the fellows stood on the stage and officially announced "Tokyo Manifest". It aimed at Asian intermediaries to build strong relationship and to develop pro bono further more. It is worth to pay attention towards pro bono movement upfront how the manifest agreed today will be realized. BRIDGE helps corporations utilize their expertise to efficiently solve social problems. BRIDGE designs and manages corporate pro bono projects and finds the right public and social partners for the companies to achieve greater efficiency. BRIDGE does not see itself as a mere service provider for companies. BRIDGE provides companies with opportunities to solve social problems. BRIDGE is currently running a national corporate pro bono campaign, CAMPAIGN MATCH, with the government to develop a culture of corporate pro bono in Korea. The more companies use their core competencies in corporate philanthropy, the more problems will be solved. Conjunct Consulting is Southeast Asia's first social change consultancy, mobilising youth and professionals to engage in pro bono consulting to strengthen social change organizations in Singapore. Conjunct does this through management consulting projects, strategic collaborations, and one-day corporate scaleathon events. Since its inception in August 2011, Conjunct Consulting has delivered 48 consulting projects with a total of 39 non-profit partners across various sectors, with over $1 million worth of social impact being created. Conjunct Consulting equips its partners in the social sector with sustainable strategies and thought processes to ensure they are ready for future challenges. Conjunct also empowers the next generation of social sector leaders with the business skills and knowledge needed for continual strategic change. Conjunct Consulting has been recognised by the government via the New Initiative Grant awarded in 2012, and was more recently awarded the President's Challenge Social Enterprise Commendation Award in December 2013. Empact, a member of Social Enterprise Association founded in 2011, empowers social organizations (non-profit organizations and social enterprises) by providing them access to affordable and quality professional services that are critical to their daily operations. We are able to do this by collaborating with practitioners, corporations, students and associations who are volunteering their time and expertise to the clients. Empact manages and interfaces with the clients so that our volunteers can focus on contributing their expertise. It was this very philosophy that led to Empact being awarded the New Initiative Grant by the National Volunteer and Philanthropy Centre (NVPC) in March 2012. The critical success factors of Singapore's economic development have always been the convergence of worldwide skills and talents in this cosmopolitan city.As a knowledge-based economy and a regional hub for many, Singapore also has the potential to become the region's largest base of pro bono service providers to non-profit and social enterprises. Ghadan is an intermediary nonprofit social enterprise focusing in the area of social engagement. Ghadan founded in Jeddah city in Saudi Arabia. Ghadan conducts a wide variety of programs and initiatives aiming at building the capacity of Saudi as well as third sector organizations to bring about an inclusive civic engagement. Our intermediary role has enabled us to operate at different levels ranging from small-scale social entrepreneurs and grassroot organizations, to large bodies of private corporations and academic institutions in Saudi Arabia. Ghadan has just started a pro bono initiative covering the kingdom. "I can say that pro bono movement is in an early stage and from our pilot with companies and NGOs and our experience, we see a great potential for expansion." Based in Beijing, Huizeren was established in 2003 as an NGO that researches and develops volunteering management mechanisms for social innovation in China. Huizeren provides capacity building through professional volunteers to support the sustainable development of China's civil society. Since 2011, Huizeren has completed 46 Volunteer Service Grant pro bono projects in Strategy Planning, IT, Marketing, HR, and legal services, and connecting 89 NGO organizations to professional talent in companies like HP, IBM, Standard Chartered Bank, Ericsson, PWC, renrendai.com, EMC, Baidu.com and Lenovo. Through these projects, more than 360 professional volunteers have collectively contributed 10050 hours to pro bono service. In 2014, Huizeren plans to continue scaling the program by implementing 30 more projects for 100 NGOs. Civil society in China began to emerge following the Wenchuan earthquake and took off during the Beijing Olympic Games in 2008. People voluntarily organized themselves to set up NGOs using their own social resources to provide public welfare services to China. Due to scarce resources, undeveloped infrastructure, and a lack of technical expertise, NGOs find it hard to succeed. So we need to promote cross-sector working between NGOs and professional corporations. Huizeren sources, matches, and manages professional volunteers placed on projects with NGOs. These volunteers provide professional and technical services, and help establish a bridge between enterprises and public institutions. Huizeren helps provide more effective, worthwhile, and professional services for NGOs, which in turn promotes more rapid, higher quality development of NGOs and their work. The value of Pro Bono to China is remarkable and profound which can inspire corporate volunteers to make a difference for China. iVolunteer is a social enterprise that promotes volunteering. Our mission is to bring volunteers and organisations together to share time, skills and passion to promote India's social development. Over the last decade, we have expanded to reach out to over 300 organizations in India and over 40 countries globally and today, have an all India presence through offices in Delhi, Mumbai, Bangalore, Chennai, Kolkata, Hyderabad and Pune. We reach out to more than a lakh of individuals and engage 1000 active volunteers at any given time, making us one of the largest volunteering enterprises in India. Whiteboard, an initiative of iVolunteer, aims to be an engaged and dynamic volunteering eco system where NGOs have access to the best professional expertise to help them in what they do. 'GYAN' an acronym for Get Your Answers Now are customized and highly interactive training workshops designed to build capacity of employees of Non Profit Organizations. SESNET was founded by experts and retired CEOs working in various fields, including Business Management, Law, Design, Science/Technology, and Media/Marketing. Based on the belief that "the best philanthropy is aid to independence", this team supports the establishment and development of social enterprises in an innovative way to solve social problems like poverty, unemployment, environmental matters, and insufficient social services. SESNET manages activities such as one-on-one and group consultations, online or hotline consultations, and business mentoring. The organization also holds education and training workshops called "Pro bono Hub Schools" that offer projects such as brand identity building. Social change emerged as an alternative and many sectors, for profit corporations and universities for example, are interested in contributing. We are helping these sectors get involved in social change without difficulty. TAC(Talent Achievement Consulting)is a nonprofit organization that provides talent development solution and service through skill-based volunteerism, an innovative cross-sector program design to develop talent leadership. This strategic approach to corporate human resource service builds stronger teams and develops employee skills while giving companies to a positive return on their social investment. At the same time, with the support of corporate talents, nonprofit organizations achieve better impact to the community they serve. Thai Young Philanthropist Network (TYPN) is a community of social-minded professionals with a shared goal to create a better Thai society for our generation and the next. Founded in 2008, TYPN initiatives focus primarily on empowering underprivileged and strengthening capacity of leading change agents in Thailand. TYPN has grown from a group of 10 at its inception to over 2,600 members as of August 2014; initiated 20+ projects which directly benefiting 1,200 marginalized population; empowered over 50 social purpose organizations; and engaged nearly 1,000 of active citizens in the process. TYPN is a volunteer-based network. All the core team members, including the founder, have worked on the projects part-time and on voluntary basis. GLab is a social innovation lab at the School of Global Studies (SGS), Thammasat University. GLab is a think-and-do unit, applying human centered design to co-create innovation for social change in Thailand and beyond. In 2014, TYPN and GLab has collaborated to systemize advisory and professional service provision to Thai social purpose organizations with no or minimum cost. The project is a scaled up effort of TYPN to unlock more human capital, through public-private-people partnerships, towards capacity building of the social sector in Thailand and beyond. Additionally, TYPN started the Brain Exchange Initiative (BEX), as a platform to match top students from leading universities abroad with short-term assignments in government agencies, nonprofit organizations and social enterprises in Thailand . BEX was established and endorsed by the Royal Thai Government in 2010 with the in-kind and technical support by ChangeFusion Institute and OpenDream respectively. In the past years, BEX has mobilized graduate students from Harvard University, Columbia University and University of Cambridge to work with diverse development agencies in Thailand, ranging from Office of the Prime Minister, International Institute for Trade and Development and Mae Fah Luang Foundation. The initiative is recognized as a best practice in Social Entrepreneurship internship at Ashoka U Exchange 2014. Service Grant Japan is the leading organization of Japan's pro bono movement, from initially introducing the pro bono concept in Japanese society, to conducting more than 200 successful pro bono projects with 2,100 pro bono workers. Our mission is to nurture a healthy culture of civil society where people collaborate productively to solve social problems and act for challenges. Service Grant Japan is making various challenges for innovative pro bono models such as "Home Town Pro Bono" which supports local naighborhood organizations, "Furusato Pro Bono" which supports local community in remote areas far away from large cities, "Mama-bono" which empowers women who are taking child-rearing leave or off the job and still wishing to come back to work. 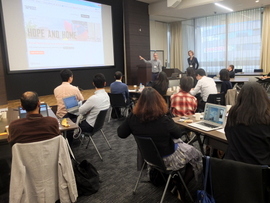 Also SGJ has provided 7 domestic intermediary organizations in Japan with training and operational support on pro bono by lending their expertise to help build a local pro bono movement. Asia Pro Bono Rally TOKYO 2014 has been launched as a non-sponsored independent initiative by Service Grant Japan.We ask all the Asian guests to pay by themselves for their travelling cost between their own countries and Tokyo, however we would hope their accommodation, transfer inside Tokyo city, and event-related costs should be covered as much as possible by Service Grant Japan. If you can have sympathy towards this event and feel positive about helping us, please join as a supporting member of Service Grant Japan. You can be a supporting member with 3,000 JPY or more. We would appreciate so much if you cooperate with Service Grant Japan. Copyright ©2019 Service Grant Japan. All rights reserved.